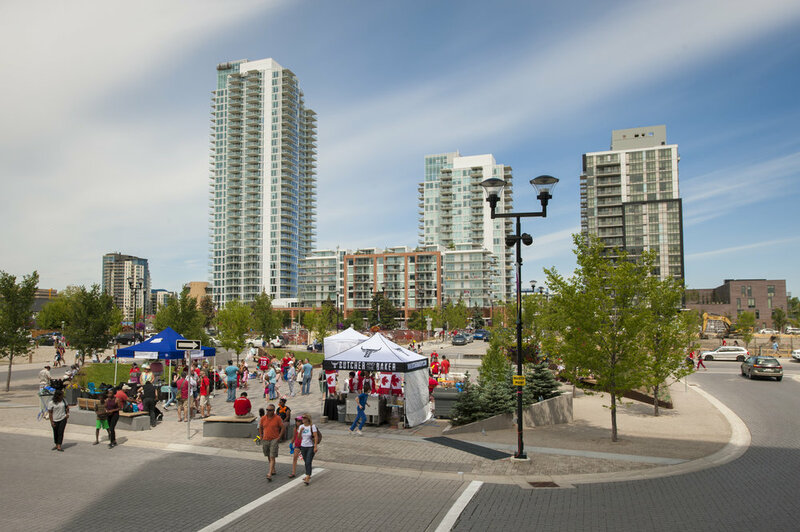 Woven purposefully into the East Village master plan are three urban parks: 5th Street Square, Celebration Square and Crossroads, each designed to nurture human connections and offer escape from the dizzying pace of daily life. Located at key points to encourage pedestrians to pause and rest and enjoy the moment, these inviting urban parks are ideal venues for small community events and festivals. 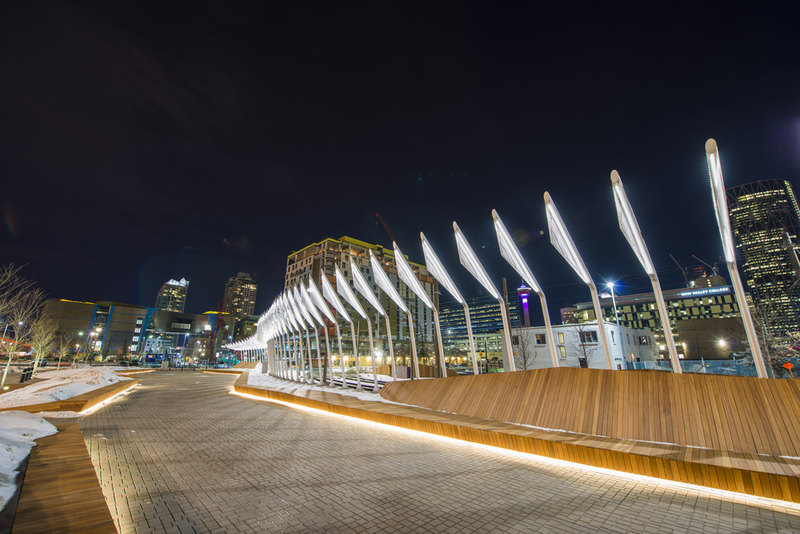 Dubbed “C-Square” by the CMLC team, East Village’s second urban square – located along Riverfront Lane (4th Street) between 6th and 7th Avenues SE – is an open, flexible “celebration space” that accommodates outdoor events and activities all year round. Building on 4th Street’s role as a commercial corridor, C-Square was designed to support retail and entertainment functions that sustain activity and energy both day and night, making it a vibrant centrepiece of the public realm. Bisected by an active LRT line, the location was ideal for a park with dynamic character enjoying broad exposure to passers-by. C-Square was designed by SMM + MBAC and constructed by CANA. The project was completed in late 2015 and has since played host to many celebrations. 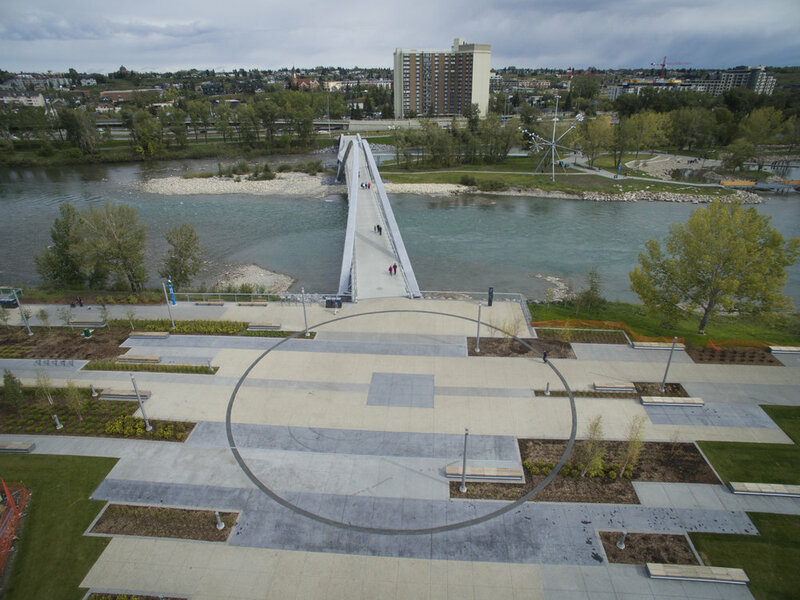 Designed to provide connections from the landing of St. Patrick’s Bridge, Fort Calgary Edges (along 6th Avenue SE) and RiverWalk, the Crossroads public space incorporates a community garden, public seating, children’s play area and “The Wheel of Women” – a circular plaza that recognizes and honours influential Calgarian women who’ve helped shape our civic thinking in the areas of: education, art, placemaking and development. 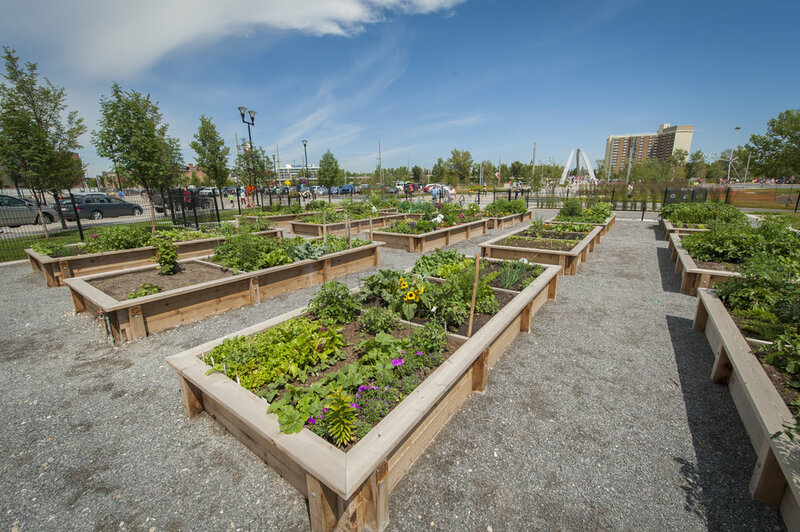 The Crossroads project was completed in November 2015 and welcomed its first gardeners in spring 2016. Located at the intersection of 7th Avenue and 5th Street SE, this urban space incorporates a diagonal pedestrian route – “the Riff” – with connections to other pedestrian paths in East Village. An inviting place to gather with friends or just gather one’s thoughts, 5th Street Square opened to the public in November 2014. The new dog park was constructed in Crossroads, an area well-loved thanks to the popular playground, community garden and trio of sea-can sheds. To deliver this project, CMLC worked with Stantec—the same landscape architect for the playground and garden—who ensured that the new addition would work seamlessly with the surrounding spaces. The East Village Dog Park welcomed it’s first visitors in October 2018.